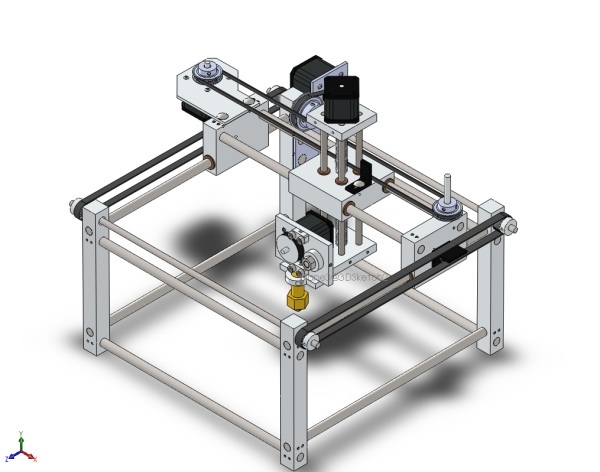 The current generation of low cost rapid prototyping machines on the market are constructed out of acrylic(brittle) or wood(shrinks/expands with humidity). The structural integrity of these machines is more on the order of something assembled with a child's construction set than a machine that will hold tight tolerances reliably. The machine is designed in a way that makes manufacturing errors very apparent during the assembly process, it becomes nearly impossible to fit together if holes do not match exactly between matching parts because the steel rods bind inside the aluminum posts on each corner of the machine(holes are reamed on mill, rods are ground to +- .0005"). The electronic control systems used in these small machines are fairly trivial, we plan to eventually consolidate of the components onto a single printed circuit board to avoid using any sort of pre-made breakout boards. The metal components don't have too many complex features at the moment, and will stay that way to keep costs down.